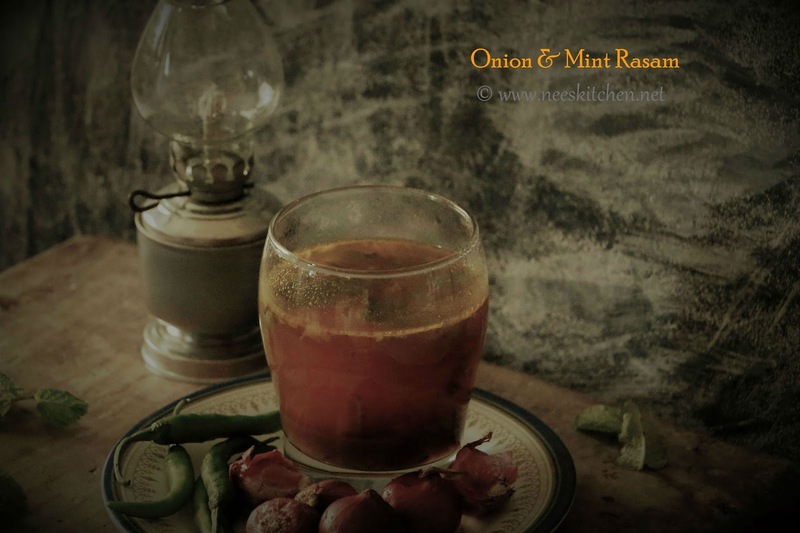 "Onion Mint rasam" is a simple rasam recipe with onion flavor primarily infused in it. 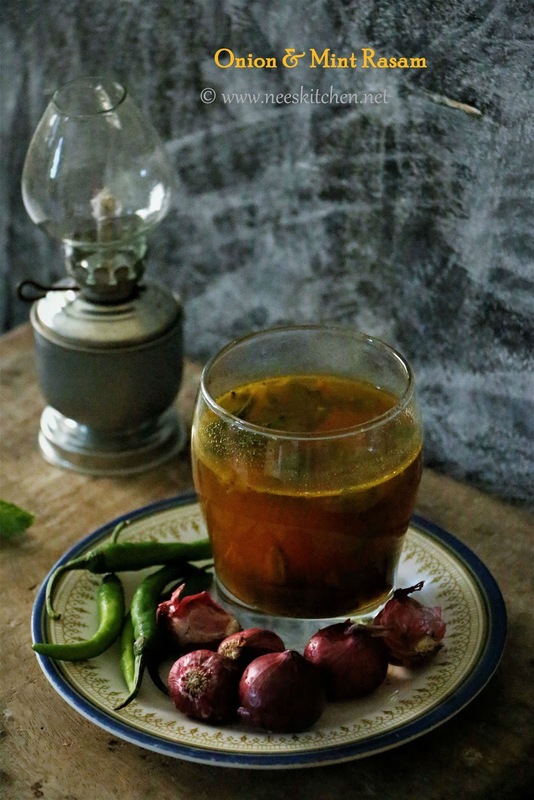 Preparation of this rasam is slightly different from the regular rasam as here we temper first and then boil the tamarind water and rasam powder. Addition of mint leaves & carom seeds adds a perfect touch to this rasam. 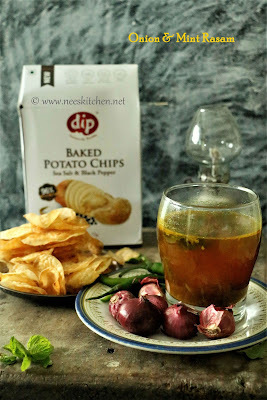 It has been raining here on & off for the past few days and one the favorite cold-weather comfort snack is potato chips. DIP Foods sent me a packet of baked potato chips. The chips were light and had very less spice and oil free. With 96% less oil and a similar reduction in fat, the product meets high expectations of consumers looking for a Lifecycle change. 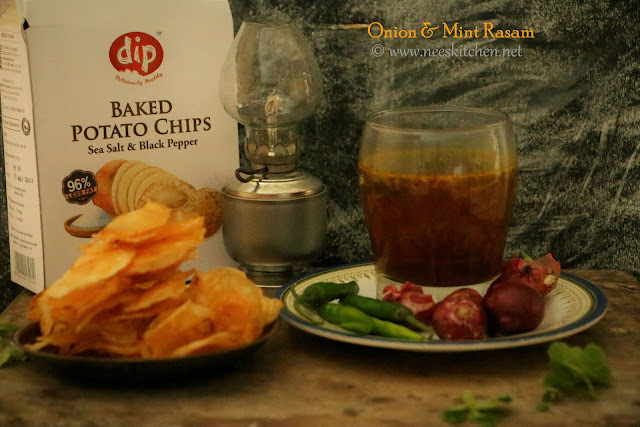 To go with onion mint rasam, potato chips makes a perfect accompaniment along with DIP Foods Baked Potato Chips. Shallots /Small Onion – 4 nos. 1. To begin making the onion rasam, peel shallots/small onions and chop them finely. Reserve 1 tsp of chopped onions for garnishing at the end. 2. Prepare the tamarind extract by adding 200ml water to tamarind and diluting it. 3. The rasam cooking process starts with tempering first, so take a stainless steel bowl and add 1.5 tsp of ghee to it. Once the ghee is melted, add mustard seeds and as they splutter, add green chili and carom seeds in low flame. 4. Once the carom seeds are fried, add the sliced onion and sauté till the onions are caramelized. The onion flavor would be infused into the tempering once they are caramelized. 5. Add mint leaves and sauté for a minute. 6. While the tempering in done, continue to making the recipe by adding the tamarind extract & remaining water, salt to it. Bring to a boil and cook on high flame for 3 minutes and medium flame for 7 minutes or till the raw smell of tamarind disappears. 7. Add the rasam powder, remaining water and continue to cook in medium flame until rasam becomes frothy at the top. 8. Switch off immediately, add the reserved 1 tsp finely chopped small onions and close with a lid. The addition of onions which are provides a crunch while consuming the rasam. Allow the raw onions to infuse for at least 30 minutes. 9. Serve with hot rice.